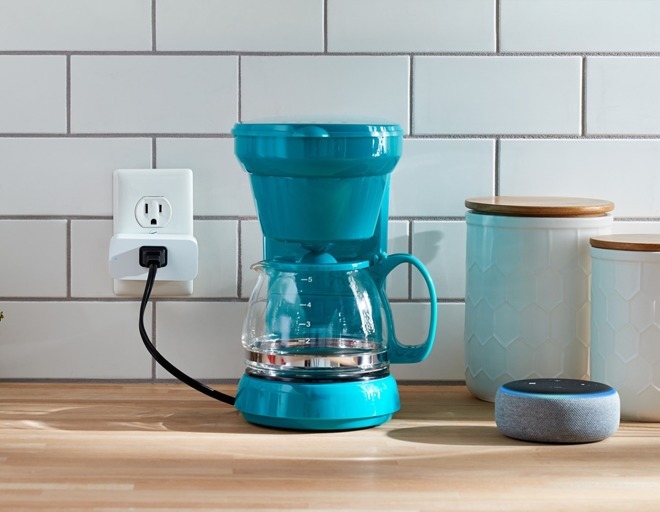 At its product event in Seattle Thursday, Amazon unveiled a new Amazon-branded Smart Plug, meant to allow Alexa control of plugged-in appliances. It was one of several home automation announcements, along with the speakers announced at the same event. The Smart Plug announcement had been tipped off earlier in the day, when website Pocket-lint discovered a listing for it on Amazon's U.K. website. That listing stated that the Smart Plug "works with Alexa to add voice control to any electrical socket." The device was formerly announced Thursday, and priced at $25. Third-party smart plugs are already on the market, working with the ecosystems of Amazon, Google and Apple. The Wemo Mini Smart Plug, introduced in July, was the first product of its kind to offer HomeKit software authentication. But the new device is unique in that it is Amazon-branded. Amazon has unveiled the Fire TV Recast, a companion product to the Fire, Amazon's Apple TV competitor, according to the About Amazon internal live blog of the event. The Recast is a companion DVR that "lets you watch, record, and replay free over-the-air programming to any Fire TV, Echo Show, and on compatible Fire tablet and mobile devices." Users can also record up to four shows at once. The new Alexa Guard is meant to "integrate Echo devices, smart lights, and security service providers to help customers protect their homes while they're away." Its features include Away Lighting, which deters intruders by turning lights on to imply that someone is home. Amazon announced, in collaboration with Ring, its new Ring Stick Up Cam, which is available in both wired and battery configurations. It will retail for $179.99. 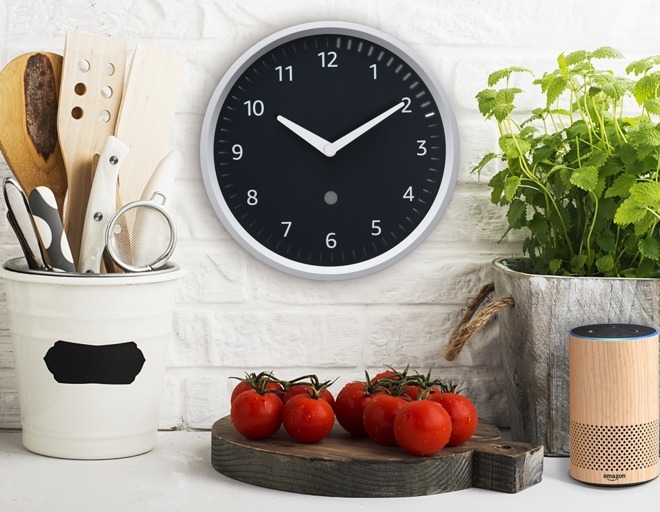 Amazon has unveiled a clock, called the Echo Wall Clock, which integrates via Bluetooth to the user's Echo devices. Shipping later this year, it will retail for $29.99. The Smart Plug is the first Amazon product to use Wi-Fi Simple Setup. "You plug in the Wi-Fi Simple Setup enabled device, and it immediately looks for the Wi-Fi Simple Setup Network," according to the live blog. "Once it receives the encrypted credentials, it securely connects to the network. And, all of that happens in less than thirty seconds." Customers can set up the new Amazon Wi-Fi Locker in order to "re-use network credentials to setup a new device." Amazon also announced that it has released version 4 of its smart home API, which is now in public preview. 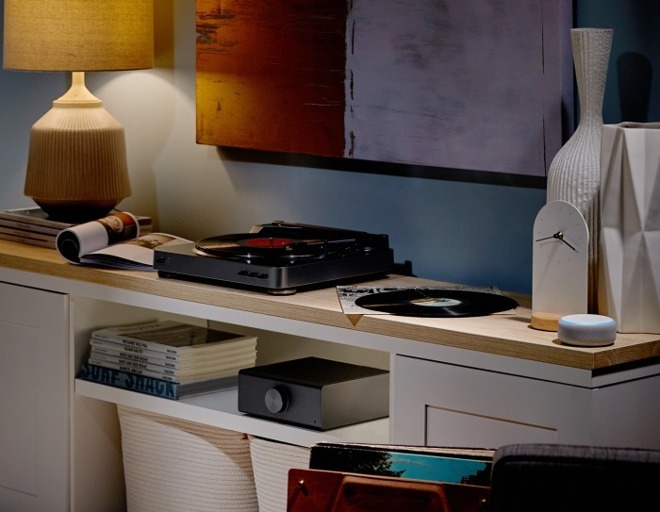 Amazon also announced the arrival of Alexa Connect Kit, which it calls "the simplest way to create Wi-Fi connected, smart home products." The kit includes software that "automatically and securely connects to Amazon-managed cloud services." Amazon also announced a surprising new hardware product: A microwave. 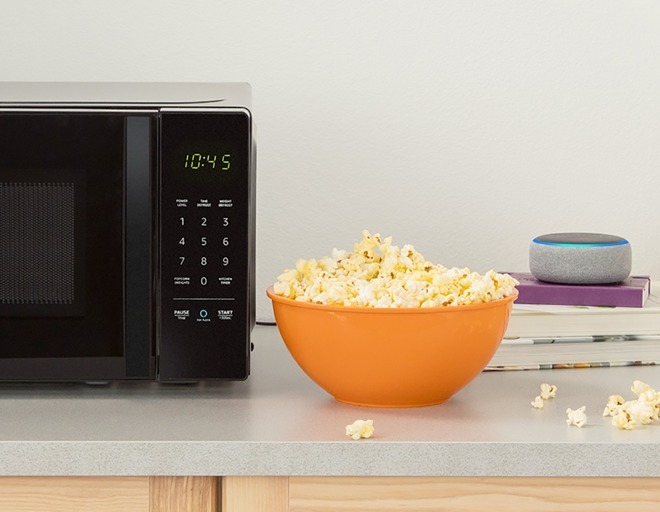 The AmazonBasics Microwave includes dozens fo voice presets, that work with an Ask Alexa button. The microwave also includes integration with Dash replenishment, to order more popcorn when the user is running low. The Microwave will retail for $59.99.